To start, I stamped my “crafty friends…” sentiment on white cardstock and used a circle die to cut it out. I used my lightest grey alcohol marker and colorless blender to add a soft shadow around the edge. Foam tape adheres it to a scalloped circle diecut. A little Wink of Stella adds some shimmer to the scalloped circle and more foam tape pops it up from my bright colored pre-made A6 card base. 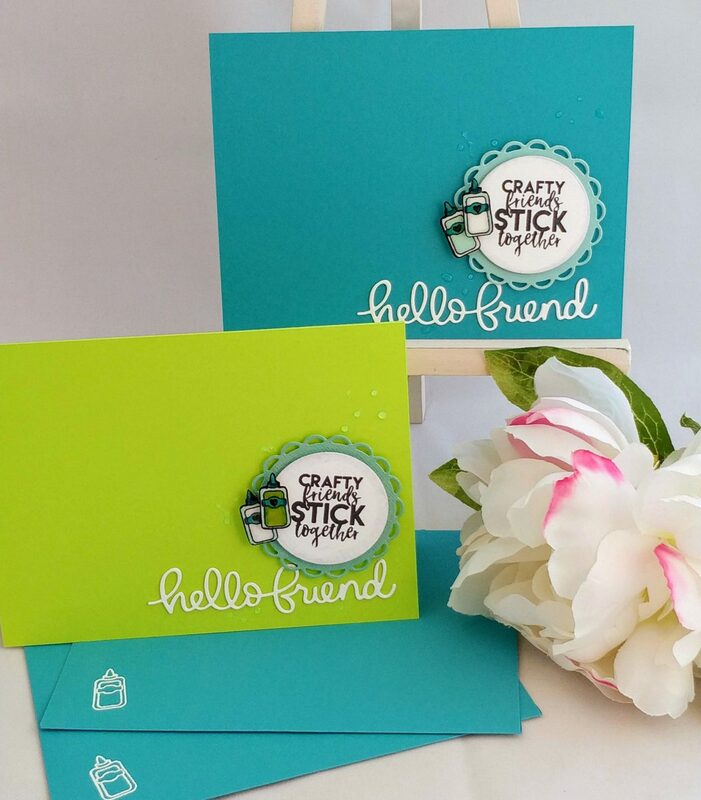 I die cut “hello friend” three times (for each card) and adhered them together to give the sentiment more dimension, then adhered the sentiment to the card. I stamped, colored, and fussy cut two glue bottles (for each card). I hand drew hearts on the glue bottle labels and added more Wink of Stella, then used multiple layers of foam tape to stick the bottles in place at different heights. 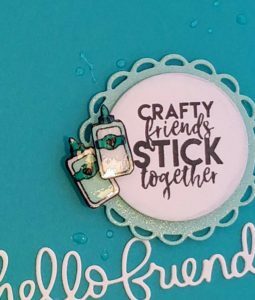 Before I added the Glossy Accents to my glue bottles and randomly to the card bases, I stamped my inside sentiment that reads,”because of all the glue.” As a final touch, I used white embossing powder to add another glue bottle to the coordinating envelopes. That’s it! I can’t believe how fast they came together and how adorable they are. Definitely my favorite stamp to experiment with . Heff ( Lesley ) is alot of fun . The Wink of Stella is addicting , working on my second gold one in just a couple months . Nice clean card .